Angela VanWiemeersch grew up as a competitive ice skater in Detroit, Michigan where she danced across the horizontal ice until her late-teens. Following a few years as a fashion design major in college, Angela embarked on a life-changing bike tour that recalibrated her life. After selling all her fashion supplies, Angela hitchhiked, paddled, and sailed her way through all of North America from the Arctic Ocean to the Panama Canal. While hitchhiking through California, Angela heard of a place called Ouray, where people wore spikes on their feet and held axes in their hands to climb frozen waterfalls. She was enamored. She took every last dollar she had and spent it on a month-worth of rent in Ouray and a bag full of used climbing gear. 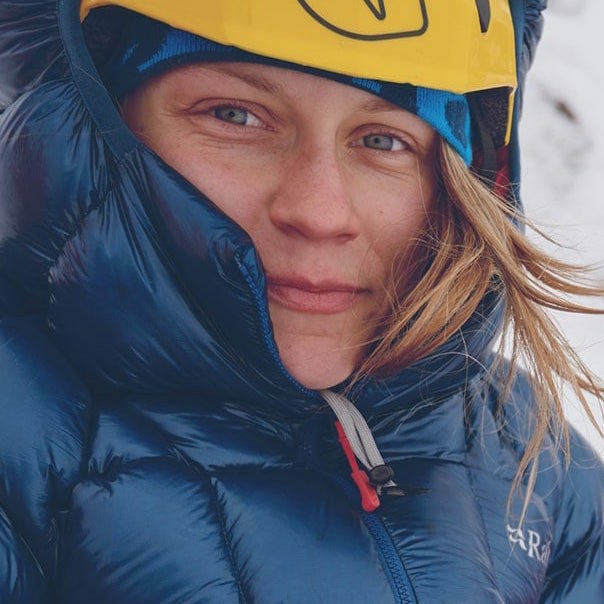 Angela found the happiness and inspiration she was looking and is now fueled by the beauty and challenge that ice climbing offers. From the Ouray Ice Park to virgin ice in Zion to amazing alpine adventures in Alaska, Angela is once again dancing on ice, only this time she’s moving upward on vertical icefalls. Angela makes her way to the Fest thanks to La Sportiva.